The Fourth of July is upon us! If there was ever a time to be a bit extra, tomorrow is the day! From the beach, to the backyard barbecue, to a going out outfit for fireworks viewing - we've got you covered. 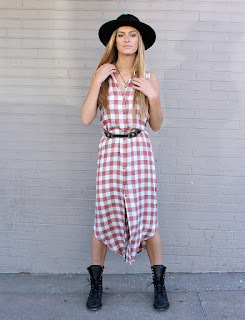 We adore this modern, feminine take on a 90's buffalo check plaid sleeveless button front dress. It's sweet, meets edgy, and we love the versatility of the style.